Komplett Arena has been home to Sandefjord Fotball since opening at the start of the 2007 season. Constructed at a cost of 100 million NOK, and named after the club’s long term sponsors, the stadium’s capacity currently sits at 6,000. To date the inaugural fixture played at Komplett Arena between Sandefjord and Lyn Fotball holds the attendance record. The opening fixture on the 21st July 2007 attracted a crowd of 8,103 and is unlikely to be beaten in the foreseeable future as terracing has been converted to seating which reduced the capacity to 6,000. Pictures of each individual stand to be added in due course. Away fans (Bortesupportere) are housed within the south-east corner of the stadium within section M as per the above seating plan. Accessible via Inngang/Gate 9 along Ringveien, tickets for visiting supporters usually cost 180 NOK when booked in advance and 200 NOK when purchased at the box office on the day of the match. You can purchase official merchandise of Sandefjord Fotball at the stadium on matchdays or from the club’s online shop. There doesn’t appear to be any guided tours of Komplett Arena available to the general public. Tickets to see Sandefjord Fotball play at home can either be purchased online from the official website (small savings to be made) or from the various ticket booths dotted around the ground which open specifically on matchdays. Please note that the above prices are only samples and they may change depending on who the opposition is and whether or not it’s a cup match. 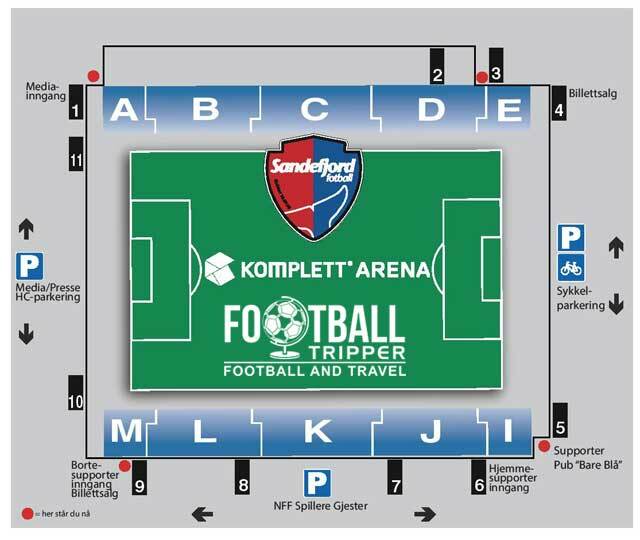 Komplett Arena is situated approximately 2.5 km north-west of Sandefjord city centre within the area of Nygård very much in an out of town location. For most Football Trippers the ground is easily walkable within 30 minutes. It’s good to know as there doesn’t appear to be any public transport available! There are a total of six car parks at Sandefjord’s FC’s stadium with the largest of them all located just north of the ground next to the Jula Department Store which is accessible from Nygårdsveien. Sandefjord Station sits on the Vestfold Line and is served by numerous InterCity Express services directly to Oslo. Within the city, it’s very much centrally located and easy to walk to. Sandefjord Airport is located within Torp less than 10 km away from the city centre. Upon landing you can travel into the city centre via a combination of bus and railway. All of Sandefjord’s accommodation options are to be found centrally within the city between the railway station and the harbour. Pretty expensive on average, the three main choices appear to be Clarion Collection Hotel Atlantic, Hotel Kong Carl and the Scandic Park hotel.